Let’s learn how to configure WiFi on Raspberry Pi 3 Model-B. We can either use the command prompt (terminal) or graphical user interface to setup wireless network. In this post, we will use a command prompt to setup our network credential onto Raspberry Pi 3. This will enable Raspberry Pi to access the internet from home router. We will complete setup of a wireless network by running just a few commands. The first step is to login Raspberry Pi 3. Then open Terminal –> Type sudo iwlist wlan0 scan –> Hit Enter. This command will scan and list all the available WiFi networks with all necessary information. We will get our home network details into this list (say for example ESSID which is a name of wifi network). This will help us to make sure network (that we want to connect) is available or not for Raspberry Pi. The next step is to add network details on Raspberry Pi 3. 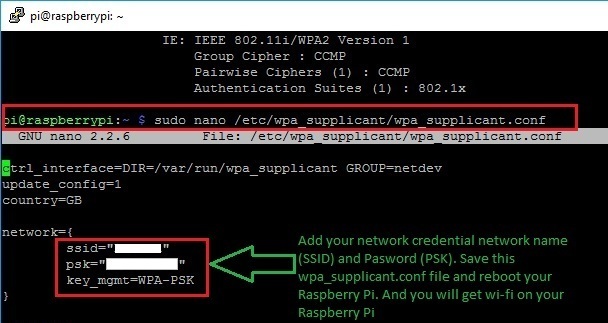 Run this command sudo nano /etc/wpa_supplicant/wpa_supplicant.conf This will open up wpa_supplicant.conf file. Add these few lines of code and replace your network information. Once we have added WiFi network details. We will have to save this file by pressing CTRL+O and then CTRL+X. And then simply run sudo reboot command which will reboot the Pi. When Raspberry Pi restarts, we will connect to the internet without using any Ethernet cable. Now we know How to configure WiFi on Raspberry Pi 3. In next tutorial, we will learn about GPIO Pins on Raspberry Pi 3. GPIO Pins are Digital Input Output Pins to control external devices using Raspberry Pi 3. I hope you will find this tutorial educational and entertaining. Thanks for reading and see you in next tutorial.